A few months ago, inspired by the Love to Sew podcast, I decided to try my hand at another Colette/Seamwork pattern (other than the Catarina, which I've worn for months and months). The Crepe is a pretty pattern, but I wondered how it would look on me (this is starting to be a theme!) as I've never worn anything like it. It is sort of an A-line wrap-dress, with the wrap in the back and a wide sash. Here's a shot from the pattern site. 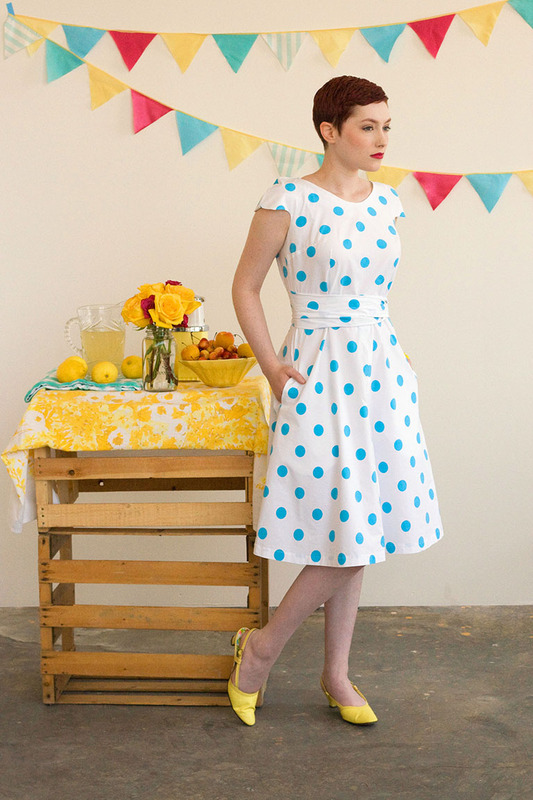 The pattern states it is a 'sweet and easy wrap dress with no closures to sew.' I think that's about right - it really isn't very hard, and there are no closures (zippers, buttons, etc. ), which makes it pretty quick. I wanted something that I could wear to work and feel really comfortable in. I LOVE gray and I wear it to work a lot, as it's a fav neutral. I also have been exploring denims lately after watching a Project Runway where the designer did amazing things with denim. I found a lovely gray semi-stretch denim at Joann's that was pretty reasonable and I got it discounted with a coupon! Despite this, I still smarted at the $50+ price tag (5 yards is my usual length cut for dresses) wondering if it would all be wasted once I cut it out and potentially messed it up. Spoiler alert - this did not happen! The gray is really pretty and the denim is both light and heavy enough for me to wear in seasonal transition months, which in Seattle are most of the months. it also has some nice stretch to it, which makes it comfier than a regular denim. One area that worried me a bit - though it shouldn't have - were the pockets. The Colette instructions were great, and easy to follow. The result? Pockets of course! If I had to do it again, I think I'd do some things differently. The pattern is big - even in a stiff fabric - so I'd size down (I'm between sizes and had sized up and as you can see, it bags a bit.) Also, I'd probably press more throughout the sewing process so that there might be less rippling in my seams. Finally, I might do more beautiful topstitching and/or detail, as this dress allows for some of that, which is one of my favorite things on clothes. The bust is slightly baggy, but I don't mind too much, as it lends a rather blousey look to the dress. Annnd finally - the back! Here's where you can see that I really could have sized down a bit. Oh well! I still love the criss-cross wrap dress look, and I actually love the look of it reversed with this in the front.